The GOP leaders have a sure fire strategy to win the Senate in 2014 — follow the 2012 election strategy, but this time do it right! I wish this was a joke with a punch line, but sadly it isn’t. During the 2012 election year I sat through dozens of inside the Beltway meetings, being assured by various GOP pundits and leaders including NRCC and NRSC operatives, that ObamaCare and the economy were the two issues that would win both the White House and control of the Senate. For most of that year unemployment was still in the double digits, and in meeting after meeting historical charts were displayed proving that no one could be reelected President if unemployment was over 6.5%. This line was repeated over and over again in 2012: “We just need to tell the voters about the draconian effects of ObamaCare and the Senate is ours.” Each Senate race was outlined in meetings, with dramatic evidence supplied by the Republican consultancy about how Democrat senators up for reelection would fall with ease and the GOP would control the Senate in 2013, with President Romney leading the way to lower taxes and the end of ObamaCare. The GOP made a bet — a big bet – very early in the 2012 presidential election cycle, that American businessmen would roll over and play dead, making no attempt to save their companies from the worst recession in a century. Things were going to be so bad economically the day of the election that Mitt Romney would be swept into office, along with control of the Senate and an increased majority in the House. How did that work out?! Fast forward to meetings I attended in March of this year at which Minority Leader Mitch McConnell spoke. At those meetings McConnell told everyone in attendance that a GOP Senate victory in the fall was assured by the bad economy and the failed launch of ObamaCare. The true believers in the room nodded, and I think I heard a couple of people present say “amen”. I sat in true awe of the self-delusion of the inside-the-Beltway GOP believers whom I have been associated with for decades. The only other Republican vote-getting issue discussed at these meetings was to “show the American people that we won’t back down from Mr. Putin the way Obama did.” The GOP leaders actually think Russia’s involvement in the Ukraine is the third most important issue to Americans after 6.7% unemployment and ObamaCare, even though polls show that 60% of those Americans who are even aware of the Ukraine situation are against American involvement. The GOP strategists are once again counting on the unemployment rate to get votes and take the Senate. The jobless rate seems really bad, until Democrats and their liberal media allies remind voters that 93% of those seeking work do have jobs, and that those not seeking jobs are pretty happy with their unemployment checks, food stamps and welfare payments. Thus, the GOP consultancy claims that all Republican candidates have to do to win in November is convince the 93% of workers who have jobs and who probably have some kind of medical insurance, that their lives are horrible because of unemployment and ObamaCare. This is the same “winning” formula the GOP consultancy, Mitt Romney, Senator McConnell and Speaker Boehner had in 2012. On the other side of the campaign coin, the non-ObamaCare “positive” GOP campaign issues require several steps of logic to understand. How do you get from “lower the taxes on the rich,” to “create more jobs?” Although correct, this argument takes five steps of logic that include building wealth capital, risk investment, and entrepreneurship. Run that logic by a young single mom working as a waitress, who under federal law may be paid as little as $2.18 an hour, and see if she votes Republican this fall. The leaders of the GOP are all political detail junkies who thrive on abstract logic. On the other hand, the leaders on the liberal side understand that simple ideas requiring only one-step logic to understand, win votes. It does not require five steps of logic to get votes for an increase of the minimum wage for a single mom waitress from $2.18 to $3.62, or even $7.25. But so sure are the GOP leaders that running on just the two issues of the economy and ObamaCare is a winning strategy, that they are willing to jettison the social conservatives who have been the key to Republicans holding majorities in one or both Houses of Congress for the past twenty years.The issue of traditional marriage, which saved George W. Bush from election defeat in 2004, is avoided at all costs by the Republican candidates. Likewise abortion – the life issue – is only used to campaign south of the Mason-Dixon Line, and then only in local races. Historically the odds are in favor of an opposition party taking over the Senate in the mid-term elections during a second term presidency, and there probably will be GOP victories in November. However, with a clear understanding of the 2014 GOP strategy, which is a double down of the 2012 strategy, don’t hold your breath expecting a GOP takeover of the Senate. As social conservatives we must not fall into this defeatist trap set by establishment GOP leaders of abandoning what is morally right. For the sake of our nation we must support and elect godly social conservative men and women to Congress. In Illinois the GOP establishment will make no effort and not spend a dime to support candidates in African-American districts. GING-PAC is supporting Eric Wallace for Congress in the district once held by the corrupt, disgraced and jailed Jessie Jackson, Jr. Wallace loves the Lord and stands as a 100% pro-life candidate supporting traditional marriage. He is a conservative African-American whose voice needs to be heard not only in the black community, but by the GOP establishment as well. As chairman of GING-PAC I have consistently backed African-American conservatives because our voice needs to be heard in that community. Even when there is no chance of winning, our support is important there. Please help GING-PAC elect more men like Steve Southerland and Eric Wallace. Sadly the vast majority of the American people have a very unfavorable view of the entire Congress, because the media rarely has news about congressmen and Senators that is really fair. The media, including conservative bloggers, constantly bash congressmen without any real knowledge of who they are or what they do. Steve Southerland, a congressman from Florida, is just one of the great congressmen on Capitol Hill, of which there are many. This past week I spent nearly two hours at a luncheon with Rep. Steve Southerland, attended by just ten people. I already knew that he is a wonderful Christian gentleman who is very aware of the issues facing our nation, both economically and spiritually. As do many good congressmen, Steve Southerland works at least eighty (80) hours a week. He works on average four days a week on Capitol Hill when Congress is in session. Often the combination of hearings and votes takes up ten to twelve hours a day. (And unlike Nancy Pelosi, Steve thinks it best to know what’s in a bill before voting on it.) Somehow in the middle of this, he must deal with a steady stream of his constituents who show up at his office to discuss both important issues and yes, just to chat. Every congressman has to have at least one trained intern to take constituents on a private tour of the Capitol when they show up unexpectedly. Every Friday that Congress is in session, Steve jumps on a commerical flight to Florida to be in his district with his family. On Saturday he is usually in his district office, once again talking to his constituents and dealing with matters that are important locally. Many of those who want to speak with him are locally elected officials such as city councilmen, mayors and state legislators in his district. During the “district work weeks” which the media refer to as a congressional “recess” Steve also travels around his district visiting businesses, schools and individuals, explaining what is going on in Congress and how they can help. When not working, Steve Southerland often volunteers to work with the poor. He is a firm believer in charity rather than government handouts. During our lunch he talked to me about some of the public schools he visited in his last trip back to his district. He told me he speaks for just a short time at the schools in order to allow the students to be able to ask him questions, as this gives him a feel for the issues that are important not only to them but inside of their homes. When back in his district, Steve must also raise money — lots of money — to help him get reelected. This time around the daughter of a well-known former Florida Senator is running against him. She is a radical pro-abortion, pro-gay agenda leftist. She thinks ObamaCare didn’t go far enough, and that the government should take over the entire health care industry. Back to the lunch … This was a small lunch. I was the only social conservative at the lunch. The other eight invited guests represented industries with facilities in his district. When the food was served and before anyone could take a bite, Congressman Steve Southerland said, “Let’s say grace.” He bowed his head and thanked God for His Grace in sending the Lord Jesus Christ, and thanked Him for the food we were about to receive. You and I need to pray that men of God such as Steve Southerland will continue to serve in Congress. GING-PAC endorses a man of God to replace the criminal Jesse Jackson, Jr. 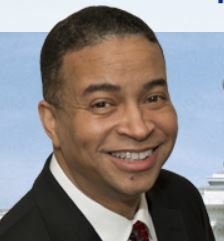 The Government Is Not God Political Action Committee is endorsing Dr. Eric Wallace for election to the House seat vacated by disgraced Democrat, Jesse Jackson, Jr. Former Congressman Jackson and his wife have been sent to prison for misuse of $750,000 in political campaign funds. Dr. Eric Wallace is running for Jesse Jackson, Jr.’s House seat. one man and woman, and the importance of the church in dealing with gang violence, drug addiction and other criminal acts. Dr. Wallace believes that the family is the bedrock of our society and that healthy families decrease unplanned pregnancies, abortions and juvenile delinquencies. Wallace believes public policy should support traditional marriage between one man and one woman, and make laws that promote strong nuclear families. Wallace supports a Federal Marriage Amendment to the U.S. Constitution. At the top center spot on his Internet page he states that his values are Pro Life, Pro Family, Pro 2nd Amendment, School Choice, Responsible Government, Individual Liberty, Strong Family Values, and Economic Empowerment. BUT THE GOP ESTABLISHMENT WILL NOT SUPPORT THIS MAN! Dr. Wallace has post-graduate degrees in Biblical Studies and is the president and CEO of Wallace Publishing and Computer Graphics. He has served on the African American Advisory Board for the Republican National Committee and is a leader in the Illinois GOP. In 2011, he founded Freedom Journal Institute, a non-profit, whose purpose is to create a paradigm shift in the way the African American community views faith, race and public policy. Dr. Wallace is a Christian man, a family man and one who understands the importance of self-reliance and has demonstrated that through his years of hard work towards realizing the goals of informing the public through his years of media activities and public service, always with the goal of providing a positive message of hope to the less fortunate but at the same time promoting the values of self-help. Please help GING-PAC support Eric Wallace for Congress. To help Eric Wallace specifically, write a SEPARATE check this month to Wallace for Illinois and I will personally hand it to him in May when we have a planned meeting. I agree with Ron Paul on most issues. I like his ruetrn to constitution focus and limited government. I like his economic arguments generally. The one thing that I’m finding hard to swallow are portions of his international policy. To bring back troops from Afghanistan after over 10 years of trying to stabilize the country with mixed results, and to significantly reduce our troop presence in Germany is one thing. Clearly Afghanistan is as good as that backward country is going to get, and Europe is no longer threatened by the Soviet Union (though Russia isn’t necessarily benign). However, to bring back troops from South Korea and Japan, as well as disengage almost totally (militarily) from the rest of the world is almost insane. America shouldn’t look for fights, but also shouldn’t abandon our allies and friends around the world to the influence of increasingly aggressive regimes. Our troop presence in South Korea is a show of solidarity with one of our closest allies in the world against a tyrannical regime to their north (a nation which, by the way, we are technically still at war with). Our troop presence in Japan is a protection force to supplement an inadequate self defense force (Japan cannot constitutionally possess a force capable of war limited by article 9 of their constitution). With China aggressively modernizing it’s military and rapidly expanding it’s Navy, a Japan wary of these developments welcomes such protection, and having a physical military presence is a tangible symbol of our commitment. I find myself liking Obama’s foreign policies, but hating his domestic/economic policies, loving Ron Paul’s domestic/economic policies and mixed on his foreign policies. I admire Ron Paul sticking to his guns , but isn’t foreign policy more complicated than a one size fits all solution? Looking forward to anyone trying to convince an undecided, independent voter.